Maxi Minx has been feeling particularly troubled recently with classmates continually calling her a weirdo. It’s been going on for a while. She’s carved the hidden side of her bed with “I am a weirdo” and I sometimes find that she’s written it on bits of paper littering her bedroom. Every time she’s mentioned it I’ve told her to keep on daring to be different, that I treasure her individuality and that when she’s an adult she’ll be glad she wasn’t a sheep. But it’s hard to take that perspective when you’re only little! Sometimes, though, you hear what an outsider says better than you hear yer auld mammy’s words. 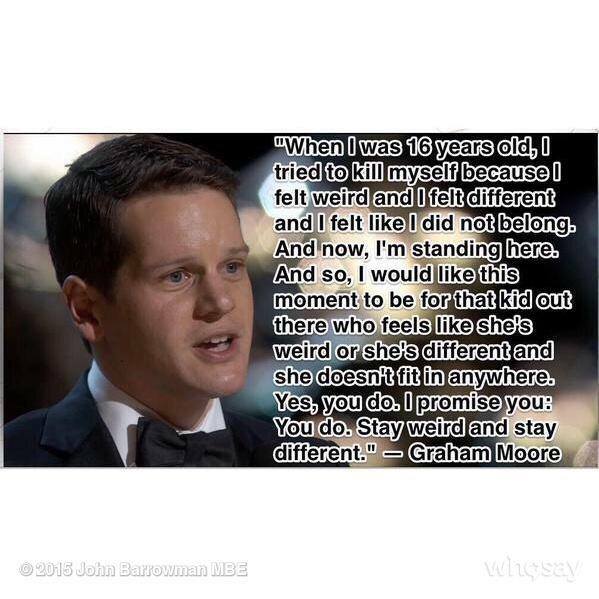 So last night I shared this quote from Graham Moore’s Oscar acceptance speech with her because she’d had another anxious evening after more name-calling. 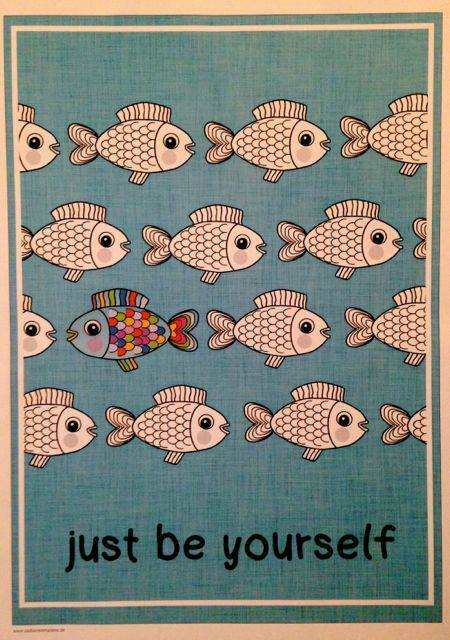 We had another chat about individuality and the qualities that make people special. I found a YouTube clip of Moore’s speech and we listened to that as well. I shared the quote on my Facebook status. It had a huge impact on Maxi. She hugged me and said I’d made her night. She wrote out the quote twice. She pinned one to the wall beside of her bed, and she folded the other one up to take to school in her pencil case, where she can reread it when she needs to. After she went to bed, I checked Facebook again. My status had grown into a long series of heartfelt posts sharing fellow weirdos’ school experiences. The sheer love and support in that thread made me cry. So this morning before school I sat Maxi on my lap and we read through it together (she’s 8 and I curse and rant a lot on the privacy of my page, so she’s entirely banned from seeing Facebook over my shoulder). She hugged me tighter and tighter as we talked about how so many people feel or have felt the way she does. We talked about the things all us fellow weirdos have in common (personal success, strength and achievements) and what characteristics the tormentors and bullies share. Normally when I ask her who calls her a weirdo, she just wails, “Everyone!” This morning I challenged her to list names. Funny old thing, the same 3 names as have repeatedly tormented her for being half-English, and who allegedly bully and tease another family of kids over their surname. None of the bullies are the brightest of God’s little sunbeams (! ), but they’re certainly smart when it comes to stinging other kids’ feelings. On the other hand, she told me that 2 older girls call her a weirdo and routinely tell her that being weird is a good thing to be. I figured Maxi’s maybe a bit young to discuss how people have ‘reclaimed’ hurtful slurs from homophobes and racists, for example, but I think she understands. The minxes’ school never ignores reports of bullying. Perhaps their favoured method of dealing with it, though, is discussing it in Circle Time. I’m yet to be entirely convinced on whether it works to change attitudes and behaviours – maybe. I wonder what difference it would make, though, if kids could challenge each other directly on instances of anti-social behaviour in Circle Time instead of speaking about problems generically? Anyway, I think it’s my responsibility to teach her how to deal with unfair criticism and fools rather than rely on teachers rescuing her every time. Otherwise how will she handle bigger idiots in high school? Or in the work place? I guess I need to teach her a lot better than I’m currently doing, though, so I really valued the help from my friends on my Facebook feed! Still, I suggested to Maxi that she show her teacher Moore’s quote and ask for Circle Time today to be held on name-calling. On the way to school this morning I called Maxi over to the miniature flower bed Midi and I had made last month. ‘Flower bed’ is a bit grand – it’s a teeny patch of scrubby ground that I put a tray of cheap, dried-up flower bulbs under. Astoundingly, some of the anemones are starting to poke through the caked, dried mud, their growing red buds leaving cracks in their wake. “What can you see there?” I asked Maxi. “Oooooh, there’s buds coming through! Four of them! And they’re all red. Oh wow!” she breathed. “Do you see how even though me and Midi flattened the ground over them, they’re still breaking through? They’ve not given up, getting stronger all winter long. Even though there’s lots of heavy mud all around, trying to force them down. They’re nearly ready to blossom and show the world how special and beautiful they are. Just like you. When kids call you a weirdo, rise above it. When you’re older, you’ll bloom into a very special young woman. I promise”. No, she didn’t vomit at that! She just smiled, laughed, wondered what colour the flowers would be, then skipped off to school: armed and ready to challenge a handful of idiots. I can’t wait to hear how she got on!